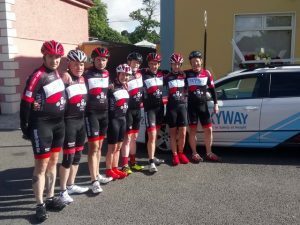 Moynalty Cycling Club are once again lending their invaluable support for Race Around Ireland this year. Kevin Stewart outlines for us here the special bond that exists between this enthusiastic and energetic club from the heart of County Meath and Ireland’s toughest bike race. Tell us how Moynalty CC came to be involved in Race Around Ireland? It is fair to say that Moynalty CC knew little or nothing about the Race Around Ireland when it first started. But that all changed in 2014 when one of our club members, Seamus Smyth, announced that he was going to enter the race as a solo rider. Everyone thought he was mad and that he would never do it. But as he started his arduous training schedule and stories began to emerge about him being spotted on his bike in the dark and miles from home it dawned on everyone that this was one determined man and that if anyone could do it then he could. I think it was the weekend of the Wicklow 200 that finally convinced people. Seamus cycled from his home in Co. Cavan all the way to Wicklow, finished the challenging 200km event and then cycled home. That was some achievement in itself but when he told us the stories about the comments he got from the revellers leaving the night club in Kells as he passed them on his bike at 3.00am and followed that with the accounts of how he slept in a hedge and then got lost in Dublin on his way home the club was hooked. Very little work was done that week around Moynalty as people watched the little black dot that was Seamus on the RAI website. And when he finished in Navan with just a few hours to spare to the deadline he was greeted by a fantastic crowd of family, well wishers and supporters. The Moynalty Cycling Club RAI adventure started from there. The only question then was “who is doing this next year…?” And it’s been that way ever since. The club contributes with vital volunteer support for RAI. What does RAI mean to you? I suppose it was inevitable that Moynalty would step forward when Alan was looking for a new HQ and finishing venue for 2016. Following the solo ride by Big Seamus in 2014 a 2 man team had entered in 2015. Enda Murray and Paul Kelly endured a lot of hardship and illness on the race but still managed to make it home safely and again there was a tumultuous welcome. In 2016 it was a 4 man team and the fact that the finish was in Moynalty added to the excitement. At this stage Moynalty CC is part of the RAI story and race week is now an important fixture in the club’s calendar. Club members volunteer to help out and the Threshing Field is a fantastic HQ. And of course the warm welcome that you will always get from the community in Moynalty is there in abundance for everyone, staff, riders and crews. I presume that it’s a logical development from supporting the event to entering a team? As I said it started with Seamus Smyth and grew from there. It was an inevitable progression that there would be a Moynalty team every year, a 2 man team in 2015, a 4 man team last year and of course an 8 person team for this year’s event including our first two women riders to take on the challenge. No one else has yet stepped up to do it again as a solo rider but I think that will happen. This is a great club and we have a lot of very talented and determined riders. Already the conversation is about who will make the team for 2018. And as well as the Moynalty team there are 3 of our club members with other teams and others crewing. It’s a great cycling week. Race Around Ireland is a massive logistical undertaking. What did you learn from your experience competing last year? Can you speak a bit about what’s involved in putting an eight-man team together and what the big challenges have been in getting this far and what your foresee as the issues for a smooth event in August. Every year has been a learning experience for both riders and crew. Keep calm and don’t panic is the big lesson I learned in my 2 years crewing and remember that the race cannot be won on the first night. But above all try to enjoy it. Riders have been training for 6 or 7 months for this and that is a big commitment by them and their families. While enjoyment may not be the main thing on your mind as you battle a ferocious headwind and driving rain in the Kerry mountains you have to keep in mind that while you are there to compete you are also there to challenge yourself. Getting an 8 person team together was not a problem. In fact there was a waiting list and I think that next year’s team is probably sorted too. 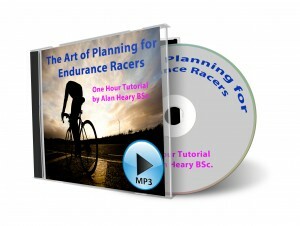 Ken Moloney, the crew chief, is a qualified coach and he put together a great structured training programme. Ken rode as part of the team in 2016 so he knows what’s needed. That programme has been followed to the letter and the riders will tell you they have never been fitter. Will everything go smoothly? I hope so but probably not. Over 3 or 4 days and around 2,200kms of riding there will always be a few unforeseen events but if everyone stays calm then these things can be overcome. A rider can get sick, a car can break down, you can take a wrong turn, but the key thing is to get back on track as quickly as you can. Every team will experience some mini crisis during the race, it’s how you react to it and deal with it that matters. One of the advantages of a big team is the opportunities for camaraderie and support through the long dreary days and months of pre event training. Do you ride together often? Yes the team rides together as often as possible. We have a scheduled club training spin every Saturday and other riders of similar standard join the group. Usually there is a second organised spin, perhaps on a Sunday and riders work away themselves or in smaller groups through the programme Ken has set for them. There have been “away days” in the Wicklow Mountains and a number of the team spent a week in The Alps in July taking on the fierce Cols of the Tour de France. There is great camaraderie and friendship between the team members and great support for them from the rest of the club’s 135 members. How do you plan to organise your squad to get the best performance? Are there any secret tips for getting back to Meath as quickly as possible? A secret tip for getting back to Moynalty? Pedal as hard as you can…. The team is divided into two 4 person squads and each will do a 12 hour shift initially with the 4 riders alternating. There will then be a full change over to the other 4 riders and so on. That way everyone gets 12 hours off in which to sleep and eat properly and to take care of personal hygiene, showers etc. which can be a big issue if not managed. That will change as we get to the last 300kms or so and it will be hell for leather on the last day with the 8 riders relaying all the way from Wexford to Moynalty. That worked well for us in 2016, others do it their way but we will stick to what we found works best. Can you tell us a little bit about the support crew? They are a vital component in any RAI bid. An experienced support crew is vitally important. We are lucky to have 8 people on the crew this year and most of them have been there before as riders or as crew. You learn a little more every time you do it. The race can be hard on crew. They have to have everything in place and have the riders and their equipment and supplies where they are meant to be and on time. They have to navigate without taking wrong turns or getting anyone lost. Change over can be frantic and tempers can get frayed. You need people that will stay calm and focussed and that have a thick skin. The crew are often awake and working when the riders are asleep and recovering but that’s the nature of the role. And it’s a great event to be part of, a big adventure, a week to remember.